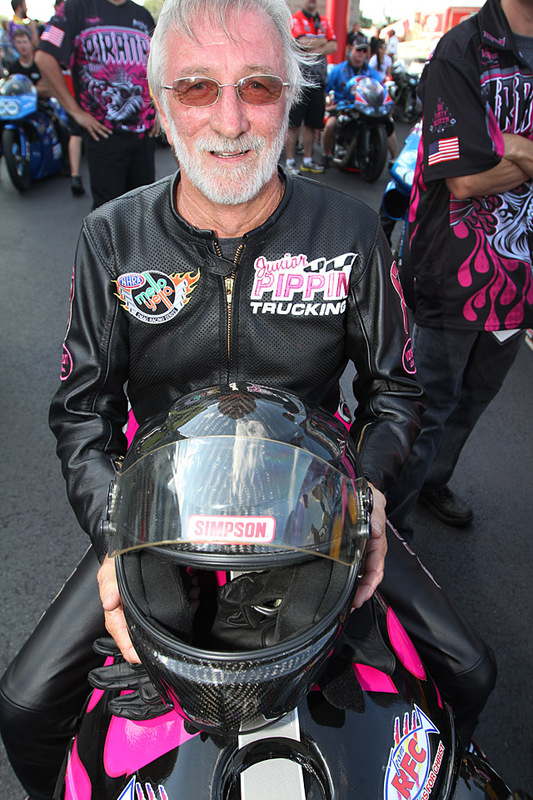 The 60 year-old Pippin—owner of a Conyers, Georgia trucking company and a life-long V-Twin drag racer—sat the last two years out of NHRA competition while supporting his wife Lisa in her battle with breast cancer. With her health on the upswing and feeling like he should be taking a more active role in fighting the disease, Pippin and sponsor Mark Whisnant of PiranaZ took to the track in Charlotte to promote their fundraising effort. Although a bit crusty and rusty, Pippin and tuner David Bost actually made a pretty good showing. Consider that qualifying 19th would have placed him in the top half of a NASCAR field. 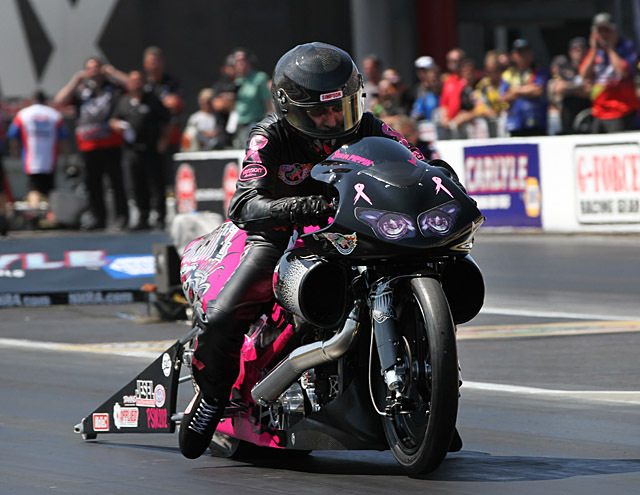 But in the ultra-competitive world of NHRA professional drag racing, Pippin finished outside the 16-bike raceday field. “We got better each pass,” noted Pippin. “We had some battery voltage issues the first two passes that got us behind the 8-ball. And after a little over two year hiatus, I finally got to riding those last two passes. We had those battery issues rounds 1 and 2, but I also simply wasn’t doing my job. And it’s frustratin’ when you know you’re not doin’ your job. But at the tender age of 60, it took me about three whacks at it to get dialed-in. But those last two I hit my shift points good, was on the money, and I just wanna ride it some more now. “But most importantly, we got a little bit of TV on ESPN2 for the breast cancer deal and that’s what this is all about anyway. I believe Mark may have sold out of T-shirts here at the track, but he’s printing more and everybody that wants one can go to www.piranaz.net and buy ‘em, but he’s gonna have to make some more, that’s obvious. It’s been humbling, overwhelming, and exciting to see all the response that we’ve had. So many people have come by the race trailer looking for the shirts and we’ve sent them down to the PiranaZ trailer. The response has been really good. “I’m hellbent to see if there’s someway that I can help prevent a family from going through what ours has gone through here in the last two years. That’s worth everything I can throw at it. “Lisa has to be back at Emory next week, and we’ll see what we’ll do with our racing schedule providing everything comes back good with her—and I’m thinking that it has to, it will. At least we pray for that. She looks real good and I’m thinking everything is good. It’s in the good Lord’s hands so I think that it will be. So if that’s the case then we’re gonna go to St. Louis, then to Maple Grove, and if we can get a head of steam built back up, I don’t plan on going out west but I don’t rule it out. First and foremost, I have to take care of my family. 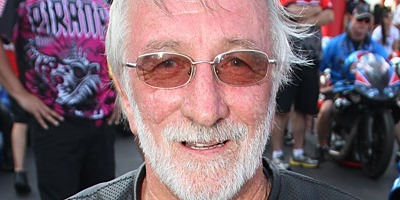 “I can give what the motorcycle costs toward the cause, but with the help of PiranaZ we can raise a lot more than that. When I called them to do this, they were so excited to get on board. Those are some really good people, and I advise folks not to just buy the breast cancer T-shirt, they have a lot of really cool stuff. “Next year we’re planning on running a full season, and we’re talking to some people about running as many as three bikes next year. That’s not a probability, but certainly a possibility. “I don’t know if anybody noticed or not, but in the last round of qualifying—while missing the field—Redell Harris (who uses engines built by Pippin’s race shop) ran a fast back half and ran about a 192 and a half mile an hour. So it’s pretty obvious that if we get the first 330 straightened out, we can run with these guys.